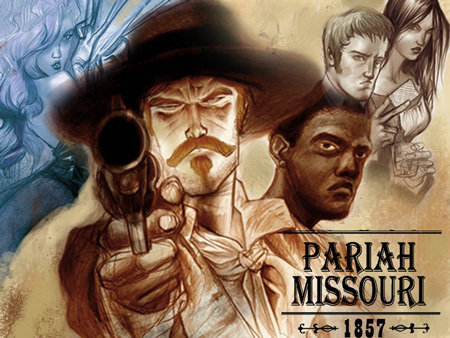 Ventura, California – November 25, 2012 – Starting off with a bang today is the Pariah, Missouri Graphic Novel Kickstarter campaign. Written by Andres Salazar and Penciler Jose Luis Pescador, Pariah, MO is a western with a supernatural twist. It’s pitched as Deadwood meets Buffy the Vampire Slayer. Part wild-west historical drama, part supernatural mystery, Pariah is set in 1857 a few years before the Civil War. Considered a team book, we follow Hiram Buchanan an undercover Pinkerton, Nellie a feisty courtesan, Jean a practitioner of vodoo from New Orleans and Toro a Comanche bounty-hunter as they ferret out evil. “We have a number of stories to tell, and this first one will be four 24 page issues. We were moving away from the issues format, but I felt it helpful to use each issue as an act-break like they do in television. The goal of course will be to have a collection of the entire 4-part story by the summer of 2013. This Kickstarter focuses on issues 1 and 2,” says Andres. You can find Andres Salazar in front of his laptop furiously typing away in one of the downtown coffee shops in Ventura, CA. This entry was posted in Columns and tagged andres sala, buffy the vampire slayer, Howard Chaykin, jose luis pescador, kickstarter, missouri, pariah. Bookmark the permalink. Follow any comments here with the RSS feed for this post. Post a comment or leave a trackback: Trackback URL.